What a strange name, it sounds like an extinct species of dinosaur! 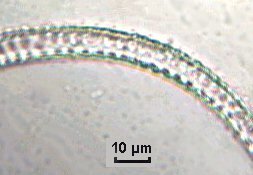 But they are microscopic 'algae', (in fact they are included in the Protista kingdom), which have the particular feature of possessing two flagella. There's a subtle difference between cilia (as present in some protozoa) and flagella, in that the latter is longer and produces accordingly longer 'waves'. We are frightened when we think of the large dinosaurs as they were terrifying and dangerous animals (particularly T. rex in the movie 'Jurassic Park'!). Here dino-flagellate means only that they have whirling flagella! Note that dinoflagellates are older than dinosaurs and they probably occurred, in evolution, before the first eukaryotes. Some theories propose that they are an association of an algae and a bacteria. But those microscopic cells are hazardous TOO; not directly for man but through the food chain because fish or shellfish eat and concentrate dinoflagellates when filtering sea water. So why are dinoflagellates hazardous? In some countries, in summer or autumn months, massive algal blooms tint large areas of the sea surface a red or yellow colour. This phenomenon called 'red tides', is often caused by changes in water temperature or light and associated with an abundance of nutrients like nitrates and phosphates (eutrophication) carried into the sea by coastal rivers. I have witnessed a serious bloom along the southern coast of France, but it wasn't visible except by microscopic observation. The guilty party was a species of dinoflagellate called Alexandrium tamarense, with a size around 20 µm. This organism produces a toxin (domoic acid or PSP : Paralyzing Shellfish Poisoning) which is poisonous for man and paralyzes the nervous system. Toxin is concentrated by filter feeding molluscs which are immunized against it and they became unsuitable for eating. In 1998 the bloom occured in October which was unusually late in the year. Many mussels and oyster breeders were very annoyed, because they didn't sell their products during the two months leading up to Christmas and the New Year. Pictures below show this algae. (The first two pictures have a poor quality because they are extracted from a video tape I have made: I did not have a capture card at this time!) Two spots are clearly visible; they are chromatophores full of chorophyll and pictures taken in U.V. lighting will show a red fluorescence of these spots. (See safety footnote). Images left: Specimens of Alexandrium tamarense at 40x. Note the two rounded chromatophores in the top right hand side image. At first sight, to an inexperienced observer, critters which are quickly moving under a coverslip are 'necessarily' animals, mainly those which cross the field of view like tiny torpedoes! But if you can see a flagella whirling behind its body it's possibly a dinoflagellate. See schematic drawing below. 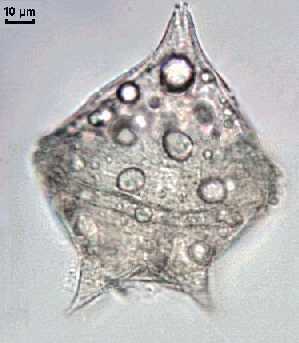 Nowadays around 2000 species live mainly in the sea but freshwater dinoflagellates exist too. Most dinoflagellates have complex life cycles with several steps, both sexual and asexual. Some of them form cysts in winter and they are preserved like fossils which are found mainly in cretaceous and jurassic features. Micropaleontology study these kind of cysts. Dinoflagellates have a surprising morphology; the two flagella have unequal lengths. The larger one is contained within a groove called 'cingulum' (or girdle) which encircles the cell body and the smallest is perpendicular to the first one running from the center to posterior end of cell. The two are fixed at a point called the 'sulcus', distinguished by a slight depression, located near the middle of the cell. Flagella are difficult to see because they are thin and constantly moving. Concurrent actions of the two flagella cause the cell to turn when moving. This annotated drawing I have made, shows parts which are common in all dinoflagellates. In some of them, a rounded nucleus is easily seen. 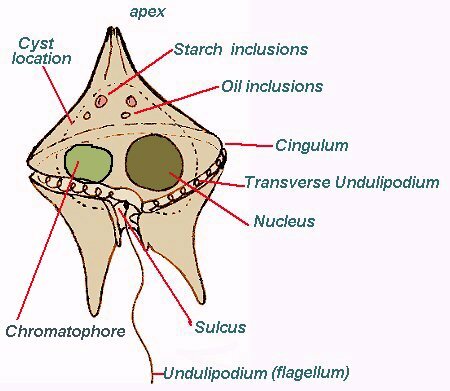 The drawing doesn't show a particular species but all the elements you can find in a dinoflagellate. Scientists prefer the term undulipodium for the flagella which have a more complex structure than protozoan or euglenoid flagella. The dotted line shows the cyst location occurring more later in the life of the dinoflagellate. Some species (Dinokaryotae) are enclosed within an envelope made of cellulose plates with irregular edges and looking like armour; it's called 'theca'. 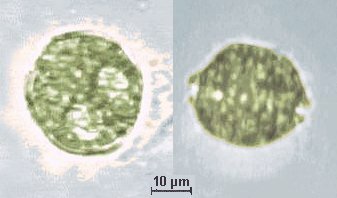 Plates are located inside the cytoplasm of the algae. (See picture below). The plates are joined by a sort of suture (arrows); their aspect is useful for classification. Species without theca are called Syndineae. 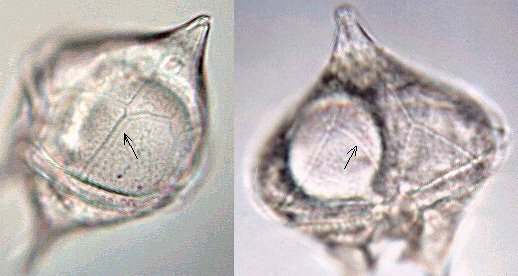 When a dinoflagellate is mounted the cellulosic skeleton appears with little holes (maybe it's due to the fixative process...): right hand picture shows this in a Ceratium arm. Many of them are autotrophic organisms using light to produce their food; some rounded chromatophores containing chlorophyll (green) or carotene (yellow/red) can be seen inside. Some of them are heterotrophic and can be parasitic. Nutriments like starch are stocked in little spherical pyrenoids or oil drops like in the left hand picture. 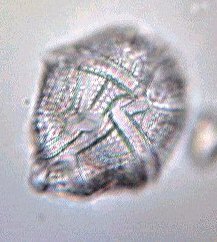 If you are interested in dinoflagellate classification look at page 3 of this article to see other links. Also visit the web page http://agc.bio.ns.ca/dinoflaj/master.htm to find a useful tool. Editor's safety note: Hobbyists suspecting they have found an algal bloom during pond and marine sampling should exercise caution. Some blooms are extremely toxic and can cause potentially serious and possibly permanent affects. Expert local advice should be sought if necessary.